Syngenta, who has their headquarters in Basel, Switzerland, is the world’s largest producer of pesticides and the third largest seed corporation in the world. Syngenta currently holds 53% of the total turnover in the emerging markets (threshold countries). Syngenta’s pesticides have been linked to numerous health issues and severe environmental damages. The company promotes a highly industrialised agriculture based on genetically modified organisms, monopolisation of of seeds, and the patents on plants. Stop export of Paraquat produced by Syngenta and others in China! 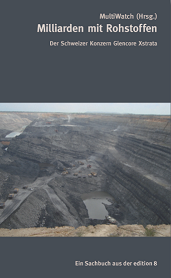 The MultiWatch-book about Glencore now available in english!